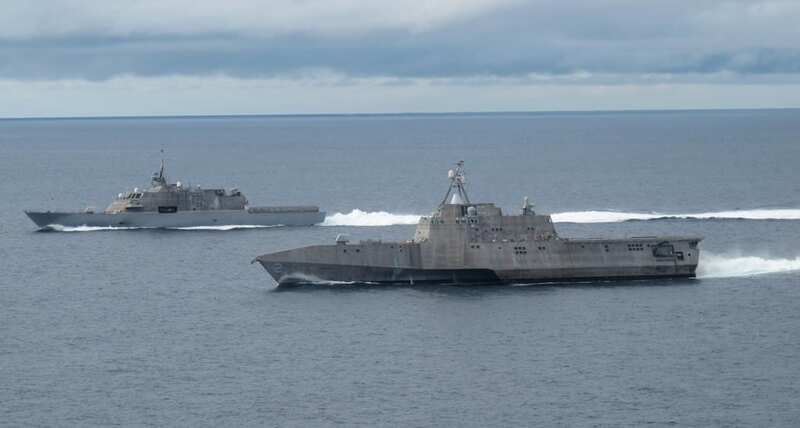 Yesterday Secretary of Defense Chuck Hagel issued a statement that might not silence the critics of the littoral combat ship (LCS), but promises fixes to one of the major criticisms of the small combatant. Two major criticisms of the ship have been its lack of armament and its survivability. Now Hagel says that a new small combatant will be developed based on the seaframes of the existing LCS designs. “Earlier this year, expressing concern that the U.S. Navy was relying too heavily on the littoral combat ship (LCS) to meet long-term targets for the size of its fleet, I announced that the Defense Department would not undertake new contract negotiations beyond 32 littoral combat ships, and directed the Navy to submit alternative proposals to identify and procure a more lethal and survivable small surface combatant, with capabilities generally consistent with those of a frigate,” Hagel said. “I specifically asked the Navy to consider completely new designs, existing ship designs, and modified LCS designs; and to provide their recommendations to me in time to inform the president’s fiscal year 2016 defense budget. Hagel said in the statement that budget considerations forced a move toward combatants that could carry out a range of missions. “The more lethal and survivable SSC will meet a broader set of missions across the range of military operations, and addresses the Navy’s top war-fighting priorities. It will feature an improved air defense radar; air defense decoys; a new, more effective electronic warfare system; an over-the-horizon anti-ship missile; multi-function towed array sonar; torpedo defenses; and additional armor protection,” Hagel said. Both manufacturing teams have proposed enhanced multimission versions of their LCS designs. It will be interesting to see what the SSC proposals include. “I have directed the Navy to assume a total buy of 52 LCSs and SSCs,” Hagel said, “with the final number and mix dependent on future fleet requirements, final procurement costs, and overall Navy resources. Production of the new SSC will begin no later than fiscal year 2019, and there will be no gap between production of the last LCS and the first SSC. A significant advantage to this approach is the ability to enhance naval combat performance by back-fitting select SSC improvements to the LCS fleet. “The Navy’s new proposal, like the LCS, will continue to have its critics, but considering the context of our broader naval battle force and the current strategic and fiscal environment, I believe it represents our best and most cost effective option. By avoiding a new class of ships and new system design costs, it also represents the most responsible use of our industrial base investment while expanding the commonality of the Navy’s fleet.